Sometimes pampering yourself isn't about being taken away by Calgon, or spending an hour in the spa, it's about letting someone or something else do the work for you, that's why I'm so pleased to be part of the affresh® team! All washing machines – no matter the make or model – can benefit from regular cleaning every 30 days. With powerful tools like the affresh Washer Cleaner Kit (with three Power Puck™ tablets and six Grit Grabber™ cloths) and the affresh Washer Cleaner pouch (with three affresh tablets), the product can clean hard-to-reach areas – behind the washer drum – and those that are easier to reach such as around the rubber door seal and detergent dispenser. Affresh can penetrate, dissolve and remove odor-causing residue that can accumulate. I'm all for leaving affresh® to do the dirty work while I blog, read a book or take the boys out for a walk and that's exactly what I did when I set washing machine on it's self clean cycles and tried out affresh®. What I really liked is that it was incredibly easy to use and not only clean my washer, but make it smell great! I love the lemony scent that greeted me when I opened the doors on my washing machine and that the scent has lasted even through additional loads of laundry! 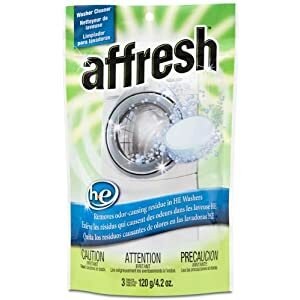 I tried it out for the first time after my daughter had let clothes sit in the washer overnight on a hot day... it had a really sour smell, even after I rewashed the clothes, but after using the affresh® washer cleaner, it really did smell better! My whole house smelled lemony fresh and all I had to do was put in the tablet, start the washer up and walk away - no scrubbing, no extra work, just some much needed free time! You can find out more at the affresh website!